I admit I’m a latecomer to the whole food storage scene. It wasn’t too long ago that the only thing I could say I stocked up on was boxes of brownie mix. Never a bad idea, but hardly comprehensive! After some research and a few missteps, my current food storage plan is built around three categories of food. 1. Grocery store goods. 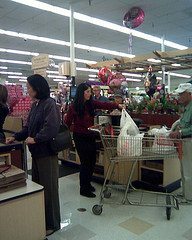 This category is the easiest to acquire, the food is often very inexpensive, and it’s all familiar stuff. During stressful times, I think we’ll all appreciate a nice big bowl of Kraft Macaroni & Cheese. The downside of this food category is that it isn’t meant for long-term storage, so keep an eye on expiration dates. 2. Freeze dried foods. These are lightweight, and don’t take up much room. You could pack 6 months worth in the back of a pick-up truck. In fact, I’ve stored ours’ near our back door in case we ever have to evacuate. With a relatively small amount of water, bingo, you have a meal. Freeze dried food is more expensive up front, but when you price it out per serving, it’s actually pretty budget friendly. One caveat. Pay attention to serving size. If you have big eaters, you may find yourself zipping through a #10 can of turkey tetrazzini over a weekend. Two companies I’ve purchased from are Ready Made Resources and Freeze Dry Guy. My friend, Suzanne, owns All-in-One Preparedness, and is especially helpful. Be sure to shop around for the best prices. 3. Bulk dry food. This category includes rice, beans, dehydrated fruits and vegetables, cornmeal, wheat, dried milk and a whole lot more. These foods are meant to last a very, very lo ng time, up to 20 or 30 years in many cases. This food must be stored correctly, but ultimately, it will be the backbone of your food storage. To get started, download Walton Feed’s catalog, and use it to check off what your family currently eats. That will give you an idea of where to start with this category of food. My own family prefers rice and beans over potatoes, so my food storage reflects that. Again, check around for prices, including local resources. A good survival library is indispensable. If the electricity ever goes out and you can't use Google to get an answer, you have your library as a resource, plus anything you've printed out for your survival binder. The book I started out with was The Crisis Preparedness Handbook by Jack Spigarelli. Any comprehensive book is a good place to start. Hey, thanks for visiting my blog! I have quite a few guy readers! With these tips here, it doesn't sound like any house needs a large pantry. Maybe a small cupboard will do. Honestly, I like the idea of storing goods at the back of the pick-up truck. 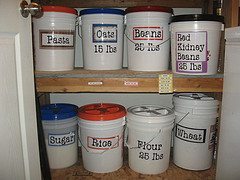 It would be better to have less food storage done inside the home. Am I right? It would be hard to store a couple of months worth of groceries in a pick-up! Foods that are dehydrated or freeze-dried take up far less volume, but are more expensive, and for most of us, are intended to be in the long-term food storage category. The back of a pickup would be subjected to different temperatures, even if in a large tool box or with a camper shell. I think that all long term food storage should be kept in a dark cool place, at least that’s what I’ve read and I’m doing. Best of luck. This do something very similar. We also added MRE's to be a bit more palatable and less prep. They are great portion control and I use them if we forget to cook lunch the night before. For freeze dried foods in No. 10 cans (both singly and by the case) I have found Honeyville Grains to have great prices and quick shipping. Your total order is only $4.49 for shipping too! Once I ordered 50 lbs of whole corn and 50 lbs of hard red wheat and just paid the $4.49 shipping fee. I thought it was a deal. I've ordered the dehydrated pork chops from the Freeze Dry Guy also and I think he's reasonably priced with quick shipping. I purchased 5 gal. buckets and gama seal lids and oxygen absorbers and stored rice, beans, pasta, etc. it was cheaper than buying from the companies. Shop at the discount grocery stores such as Sav-A-Lot and stores such as Family Dollar for great savings on generic label items. I haven't shopped at the dollar stores for food storage items, but that's definitely a good idea. Most preppers are on tight budgets, and we love finding bargains anywhere we can. For my food storage, I’ve been comparison shopping. We’ve found that Winco, Walmart, and Grocery Outlet as well as a local low cost grocery store are the best for bulk and savings. Thank you Survival Mom, Your pages of lists are now in my BOB and those of my children’s. I have been getting free 5 gallon food grade buckets from the bakery at the local grocery store. They just need the gama seals and they are ready to go for large amounts of food. The store also gives me smaller 3 gallon buckets (that fruit or creme filling comes in) that I make master mixes in and store on my pantry shelves. Having large batches of master mixes makes things alot easier for me. Many of my friends are LDS and will pick up things for me when they go to the cannery. This has helped me alot. I have also attended meetings hosted by members of their church that deal with preparedness. I learned alot at those meetings. I also found some good deals at a mill that is a few hours away from here. They sell everything in 50 pound bags. Some things were a good deal, some things were not. I am in a rural area, so traveling 100 miles one way for good deals is common. Jen, just in case Jan doesn't see your post, the classes are held at LDS (Mormon) churches. You might try contacting one in your area.